This story is about my wife’s brother, Johnny Gibbs. Mark and I didn’t know it yet, but he was coming for an unexpected visit. He stopped up the road from the ranch a ways to shave off his mustache. While he was there, some neighbors happened by and they startled Johnny, causing him to pull out his gun. Johnny stated he was on his way to see me, that he was my brother and law. The men were curious as to why a couple men on the trail came to such a surprise to him. 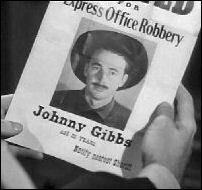 After they leave, Johnny looks at his wanted poster. Well, I had a horse named Duster I wanted to break for Mark. Several of our neighbors had already tried him, and it was now my turn. Mark was sitting on the fence watching me when Johnny came up behind him. “Well, that looks like a frolicsome little beast!” Johnny declared. “I wouldn’t bet on the rider, boy. He’s gonna get his whiskers bucked off any minute!” This started Mark and he turned to look and see who would say such a thing. His eyes grew big and he could not say anything. “Well, what’s the matter? Swallow something you can’t get down?” Johnny asked, pulling Mark’s hat down over his eyes. Mark ran into the house and sat down at the desk with his mother’s and Johnny’s pictures were. He looked at the picture and realized that Johnny hadn’t changed a bit. “I don’t know, Johnny. I think I softened him up a little,” I retorted back. Johnny went to ride Duster. Mark ran back outside and stated he knew his Uncle Johnny right off. Then he showed me the picture. I told him he was going to break Duster for him. We watched the show, and Mark started rooting for his uncle right off. He was able to calm him. I carried Mark over to Johnny and Mark jumped into his arms. Johnny stumbled a bit, which startled me, but he said he had just been laying off the rodeo lately. We said our good-byes to the neighbors and went to get reacquainted. As we were cleaning up, I asked Johnny if he was ever going to settle down, and he stated it wasn’t for him. It didn’t take long for him to get down to the real reason he came. He was broke and got an offer to meet up with a wild west show in Wichita, but there was a hitch. He needed two or three hundred dollars. “You’re looking at the wrong man, Johnny. Cash is the most we got least of around here,” I answered him. I offered to let him work for us awhile for $30 a month. Johnny didn’t want anything to do with my offer. “Look fellas, this is a family visit. Let’s not make me a problem.” I couldn’t go into that anymore because while we were talking, Alvah Kemper, a neighbor of mine, rode up and had an offer for Johnny. 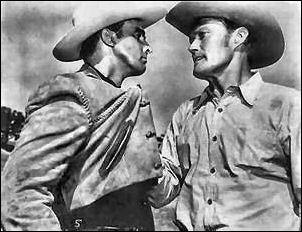 He told Johnny that he heard what a good bronc buster he was and that he would give him $100 in prize money if he could stay on Lucifer, an outlaw colt that belonged to Mr. Stacey for at least 30 seconds. He wanted to make Jeff Stacey eat crow. Jeff Stacey was a cruel man and got mostly everything he wanted. Of Course Mark had to brag up his Uncle Johnny by telling Mr. Kemper that when his Uncle Johnny got done with Lucifer they would have to change his name to 'Buttermilk'. Well, as it turns out, Johnny decided to go into town after all. Of course, I wasn’t exactly aware of what he was doing in town. That night, Mark and I were getting Johnny’s bed ready. “You think a lot of your Uncle Johnny. Don’t ya', son.” I stated. These words startled me and I stopped what I was doing for a few moments. I must admit that it did hurt a little to hear Mark say he’d rather be like Johnny than me. But I quickly recovered and said, “A little neater, I hope.” When I picked up Johnny’s jacket, a piece of paper fell out. As I picked it up, I thought I knew what it was. I slowly unfolded it and realized that Johnny was wanted for robbing an express o ffice. A rush of emotions hit me. I was angry that he had deceived the family like this. I was hurt that my son thought so much of him and was going to be crushed when he found out the truth about him. I was so angry, in fact, that I ordered Mark to go to bed. Mark was a bit taken aback at my harsh voice. He started to tell me he wanted to stay up until Johnny got back. “You heard me, son. Get to bed!” I ordered in an angry voice. Perhaps I was a bit harsh with him, but I had a hundred emotions going through me, and I needed time to deal with them before Johnny got home. Little did I know what he was planning. You see, Johnny decided that $100 wasn't enough, so he went to Mr. Stacey and offered to throw the ride if Mr. Stacey would pay him $500.00. Mr. Stacey liked the idea, but did not trust Johnny. He reluctantly agreed, but also warned him that if he double crossed him, he would answer to his right hand man, Oliver. I was there waiting when Johnny got home. I was still very hurt and angry. But I was also worried for my boy. “Let’s not make you a problem, huh?” I said angrily as I showed him the wanted poster I had found. “So you held up an express office, huh?” I yelled at him. I was so tired of hearing excuses. He told me that he was drunk and didn’t know what he was doing – that when he was leaving, he backed out right into the arms of the Sheriffs and dropped the strong box on the Sheriff’s toe. Then he told me that in all the confusion he had managed to escape. I couldn’t believe he was laughing about it – like it was a big joke. “Well, I don’t think it’s a joke, Johnny!” I retorted. Johnny was putting me in a really bad position. He wanted me to let him try to win the race on Saturday. If he was able to, he’d head to Mexico. I was a man who believed in doing the right thing. Suddenly I said, “He said he’d rather be like you than anyone else in the world!” My thoughts were now on my son and how this news would upset him. Johnny didn’t understand what I was saying. “Mark,” I simply stated. Now, THAT made me angry. I couldn’t control my raging temper anymore. I punched him right in the eye. In fact, I punched him so hard that he fell to the ground. He looked at me, shocked that I would do that to him. “Yeah. I know kids!” I threw back at him, angrily. I know my boy for sure, and this is going to break his heart! “You owe it to Margaret to stick by me. She would have. You know she would have, Luke.” I couldn’t believe he would stoop that low as to bring my deceased wife into this! I was so angry. I punched the post on the porch as I thought about it. The next morning, there was a stiff silence in the air. Mark knew there was something amiss, but he also knew me well enough not to say a word when I was in this kind of mood. Johnny thought an explanation was in order, and again, he made a joke out of a very serious situation by telling Mark that he was trying to defend a woman when a man was making a lot of “off-color” remarks, but it turned out to be her husband. I didn’t like such talk to go on with my son anyhow, and the fact that he was making a joke of it angered me more. So I decided to go to town and talk to Micah about the situation. I told Mark to clean up. The ride into town calmed me down some. I told Micah I wanted to talk to him about Johnny. “No you don’t.” I was confused. He told me that Mark had bet his week’s earnings that Johnny would win on Saturday. I hadn’t known that. That’s when I knew that I couldn’t let my boy down. I would find some other way to get Johnny out of there. I had to protect my boy from getting hurt. “Couldn’t give ‘em to ya' anyway.” Johnny muttered. “Their in pawn shops all over creation.” Johnny started telling Mark how good he used to be. 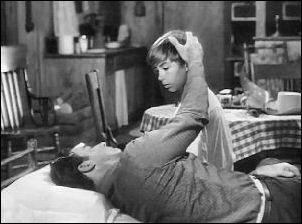 Mark told Johnny to get some sleep, but Johnny had some things to tell Mark that would do him a lot of good. The next day, Johnny approached me and told me about the deal he had made with Mr. Stacey. I suddenly grew angry again, but he told me that he had decided not to do it. He had lied about the show folding in Boston. He hurt his hip a year ago, and he was all through with the rodeo. He promised he would do his best to stay on the horse for the required thirty seconds, even if it killed him. After that, he’d be ready to turn himself in. I asked him why he changed his mind. Johnny got really quiet and looked towards the house and Mark. “Oh, I got a clear picture of myself all of a sudden,” he stated. The next day, Johnny did what he promised. Everyone was there to watch. Mark and I cheered him on the loudest of all. As Johnny got closer to that thirty second mark, Mr. Stacy grew more angry, realizing that he had been double crossed. When Johnny was done, Mr. Stacy sent his heavy to get Johnny. Oliver started to rough Johnny up, but I was expecting some sort of trouble like this and was ready to help out. I told Oliver to ride right out of North Fork. Mr. Stacy was mad and wanted to know what gave me the right to boss around one of his men. “Since one of ‘em started interferin’ with my personal family, Mr. Stacy!” I answered. “I’ve already talked to Micah,” I informed him. “And now I’m gonna talk to you about yourself. And these people you never learned to live with. You know, the way you think, the way you do things, it hasn’t won you the respect you’ve been fightin’ for. If folks knew the kind of hand you were playing today, they’d start looking down on you even more. Or worse, they might even take to laughin’ at ya'. Turnin’ away when you talk to ‘em. So, if I was sittin’ where you are, Je ff, I’d try to look at things differently. It’s not too late. You might even learn to like it.” He couldn’t say anything back. I think he wanted to get away from me! It was finally time to say good-bye to Johnny. We rode to Slone’s Crossing to meet Micah. We watched Johnny go up the hill and meet Micah. Then I asked Mark, "If Uncle Johnny sends all the Championship metals and belts that he promises, where would we put them all?" "Where would he send them from, 'jail'?" Mark asked. I jerked my head around and stared at him, surprised. I thought for a minute. The I smiled, pride was all over my face. “Seems I’ve been sightin’ you short, son,” I stated. “I thought I had to keep my boy from getting’ hurt.” Then I looked at Mark and smiled really big. I couldn’t keep the pride from my voice. “And all the time he was a man.” I stated. “I’ll have to remember that!” We waved at Johnny. 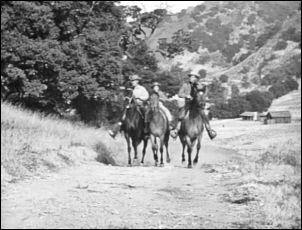 Then we turned our horses around and headed home. 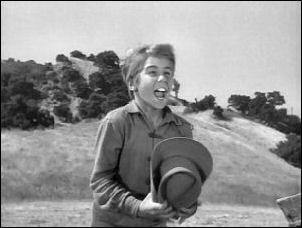 piddlin' stuff.....Jerome Courtland as Johnny Gibb, Lucas' brother-in-law - Mark's uncle. Fay Roope appeared in four episodes ― Two episodes as Doc Burrage, The Legacy and Panic. 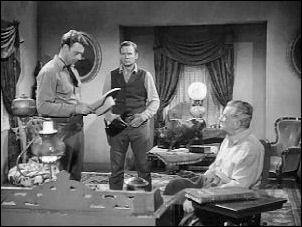 He also appeared as Barton in The Spiked Rifle as the man on the stagecoach that was more worried about his money then Mark and as Jeff Stacey in The Brother-in-law, he was the one willing to pay Johnny Gibbs to throw the contest. Charles Watts appeared in three episodes ― Panic as Maury Cass, he was the man who tricked Mark into telling him about the yellow fever ― The Brother-in-law as Alvah Kemper, he was the one who offered Johnny $100 in prize money if he could stay on Lucifer― The Mescalero Curse as Joe Beaseley, he was the man who was witnessed the drunk get run down by Juan Mogollan while coming out of the saloon. Karl Lukas who played Oliver - Jeff Stacey's heavy. Daniel White appeared in two episodes ― Hostages to fortune as Mr. Russell/old rancher, he's the one who invited the boys in for donuts ― The Brother in-law as one of the cowboys on the trail. Carol Henry appeared in two episodes ― The Brother in-law as a rancher ― The Indian as one of the townsmen in the saloon. 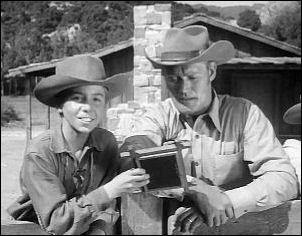 Jesse Wayne appeared in twenty-three episodes as Johnny Crawford's stuntman. Not sure who doubled for Johnny in the episode of Requiem at Mission Springs but he is a possibility, especially after that bad tumble Mark took.